On the market the other day at the Sicilian stand – Signora Anna whose hair must have chameleon DNA, because it changes colour EVERY week and hubby who looks as if someone’s taken a chainsaw to his nose. I ASSUME it’s hubby – she’s constantly moaning at him which appears to be par for the course for most of us. Two ladies standing next to me. 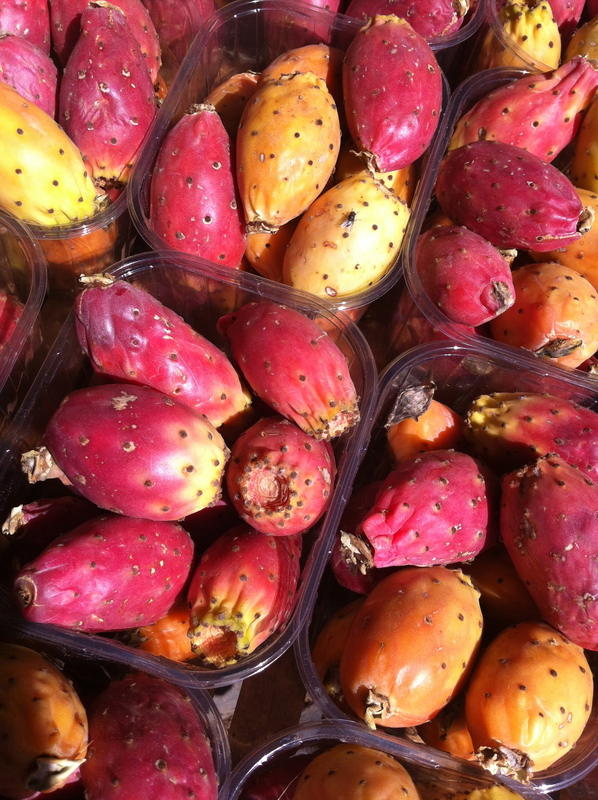 “Ei Hilde, wasissenDES…?” asks one, pointing to the cactus figs. “Cactus figs”, I say as nonchalantly as I can manage. Signs on the Sicilian stand. Fair (i.e. not greater that 30%) chance of their being orthographically accurate if it’s “zucchini” or something Italianate. Massive liberties taken with anything else. “Eidesissdochidolliänisch” says Helga. Or Hilde. “Learn something new every day, ladies” as I drift off…. 16 Sep	This entry was published on 16 September, 2012 at 13:00 and is filed under Language, Mainz, Market, Science. Bookmark the permalink. Follow any comments here with the RSS feed for this post.